With every new feature Facebook creates, I demand more. No, don’t think about it the way you do standard lists for users. I’m not going to go through and individually add fans to customized lists. Instead, I’m looking for several groups of helpful lists that Facebook can automatically generate based on some basic characteristics. I’ve run into this need recently now that we can schedule posts. It’s great to be able to schedule, but there are certainly pains involved as well. The great opportunity here is to schedule in the middle of the night (for me) to target fans in Europe, Asia and Australia. In order to generate this list, I’ve had to go into my Insights to see where my fans are located. In all, it’s a pretty time consuming process. Wouldn’t it be nice if I could instead create a list by geography? 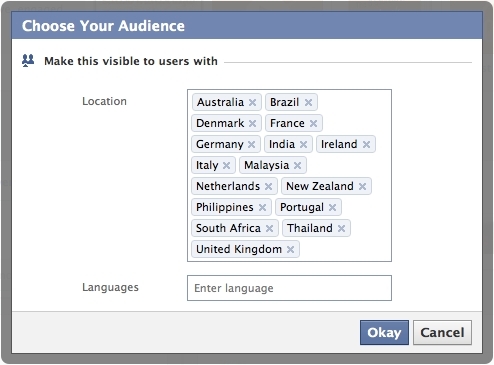 What if Facebook gave me a list of countries where my fans are located and allowed me to drag countries into individual lists for targeting purposes? So instead of entering each individual country every time, I instead enter my list called Countries Other than US and Canada? Again, there’s no need to see who my fans are and where they live. I just care about grouping them by location. When you use Facebook Lists as a user, they can be used both as the target audience or the excluded audience. For example, show this status update to everyone but Mom. Why not do this for Pages? While lists by geography would be nice, I would have to constantly update it since there will undoubtedly be new fans from unrepresented countries. So, what if I could instead write a post that excludes users in the United States and Canada? I’m convinced that there’s a significant need for this, and I’m actually a bit surprised that it doesn’t exist. What do you think? Would you use Lists for Pages? And what other Lists would you want to create?